Amanda Witherspoon will graduate from Garrison Forest School in 2014. Anna Gorman is a senior at Garrison Forest School. Measurements: Height: 34.6 cm, Width: 24.5 cm, Thickness: 3.5 cm. Date/Culture: Roman, 1st century CE. “Publius Grattius Celer, son of Spurius, of the Collina tribe. Here I, unlucky Grattius, am now cast under the cover of the earth. Living out my 23rd year, having deposited my beard, I, the unlucky one, was thrown under by an undeserved, premature and heinous death. I was pushed into these shadows against fate, killed by feet and hands. This inscription is very interesting for several reasons. 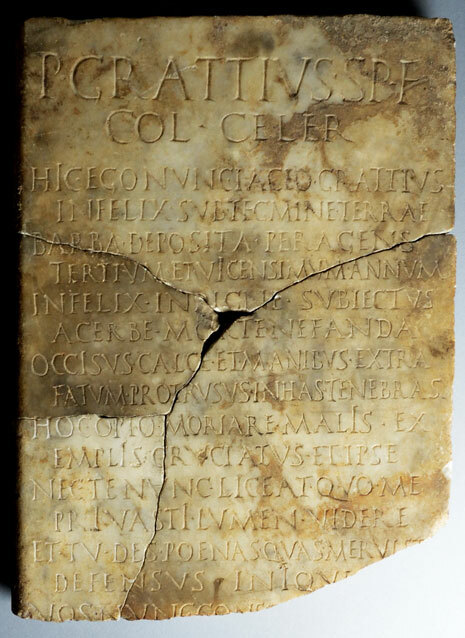 Although the practice of cursing was fairly common in ancient Rome, they are rarely found in funerary inscriptions. Rather, curses were inscribed on lead tablets that were then deposited inside tombs or wells. The museum also has an example of such a curse. In the known cases of funerary inscriptions containing a curse, it is directed towards possible violations of the tomb. In our inscription, however, the deceased himself speaks and curses his murderer. It seems that Grattius was beaten to death in a robbery, and that whoever commissioned the tombstone, probably his family, used it to utter a curse against his murderer. They furthermore deemed it important to include not only Grattius’ age, but also the fact that he had recently deposited his beard. The so-called depositio barbae was a ceremony in which a young man’s first full beard was shaved and sacrificed to the gods. This usually happened between the ages of 21 and 23, and signaled the youth’s final step towards becoming a man. Although the bottom of the inscription is missing, we can assume with reasonable certainty that the curse is complete, because the text switches from addressing a singular you (tu) to a plural you (vos). It is likely that the curse was followed by Grattius comforting his family, similar to the inscription for Agilea Prima.